Download the guide to learn how to start using commercial capabilities in SoftPro Select and become a master of efficiency and productivity. Commercial transactions are lucrative, and the sector is expected to keep growing this year. According to NAR’s (National Association of REALTORS®) latest Commercial Real Estate Outlook for 2018, commercial real estate in Small Commercial Real Estate (SCRE) markets continued to experience advances in investment sales, as the momentum picked up in the final quarter of 2017. In addition, commercial leasing fundamentals remain poised for expansion this year, boosted by an expanding economy, employment and the tax reform. Conventional wisdom says that the commercial space is where software and technology efficiency should be most useful – less time repeating manual work means higher productivity. Surprisingly though it hasn’t been the case in the commercial space as there haven’t been many solutions developed specifically for commercial closings until now. 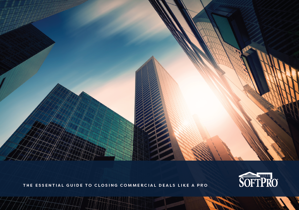 This is why we created this guide so you could learn and explore much better options to help you with your commercial closings. You’ll learn how technology can automate many of the commercial transaction processes and tasks you do manually, saving you time and money and providing much better experiences for you and your customers.